"Happiness is a loaded term that means different things to different people. To some, it might mean life satisfaction, to others, a fleeting moment of joy. 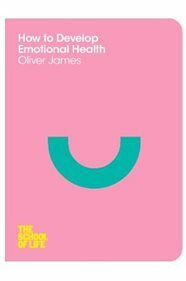 Rather than seeking to be happy, Oliver James encourages us to cultivate our emotional health. Outlining the five elements of good emotional health - insightfulness, a strong sense of self, fluid relationships, authenticity and playfulness in our approach to life - he offers strategies for optimizing each characteristic to live more fulfilling lives. Helping us to understand the impact our emotional baggage has on our daily interactions, he reveals how to overcome unhelpful patterns and become more self-aware - revitalizing our approach to life. One in the new series of books from The School of Life, launched January 2014: How to Age by Anne Karpf How to Develop Emotional Health by Oliver James How to Be Alone by Sara Maitland How to Deal with Adversity by Christopher Hamilton How to Think About Exercise by Damon Young How to Connect with Nature by Tristan Gooley"